In the Rig Veda, most hymns are by male sages. But there are a few by women, the rishikas, some independent and others wives of sages. Lopamudra is the wife of Agastya and both compose hymns. In her hymn, she expresses her sexual longing and asks him to stop his rituals and focus on her. She warns him of old age and reminds him of the value of progeny. He resists at first. But then submits. Commentators equate Lopamudra with Rati, goddess of pleasure. This hymn is one of the earliest references to the ubiquitous tension between the hermit and the householder found in Hindu tradition. Which is greater? To stay celibate or to engage in sexual intimacy? The hermit shuns the woman. The household is established by the woman. The hermit prefers the masculine world. The householder embraces the feminine world. The tension is as much about worldliness as it is about gender tensions. In later times, the hermit’s way would be seen as more pure, disciplined and Vedic, as against the dangerous Tantrik path, where the body is adored, and the woman seen as power (shakti), not delusion (maya). We see this tension not just in Hinduism but also in Buddhism. For, while Lopamudra enchants Agastya, Buddhism begins with Gautama of the Sakya clan abandoning Yashodhara. In Hinduism, traditionally, if one sees the temple architecture, one realises that the woman wins; the gods get married and enjoy worldly life. In Buddhism, Buddha is alone and serene, with a few women attendants who hold him in awe. Only in Tantrik Buddhism do women appears as goddesses such as Tara, who is sexually aggressive and demanding. In the Mahabharata, composed over a thousand years after the Rig Veda, Lopamudra’s story is elaborated. Here, she is a princess who refuses to give Agastya children until he gives her a house, jewellery and cosmetics and comes to her as a man worthy of her. So, Agastya goes on many adventures to gather wealth for his wife. Here, it is the duty of a man to satisfy all desires of a woman, for she will bear and raise his children. Without her, he cannot have children and so cannot repay debt to his ancestors. To produce happy children, he needs to ensure that she is happy. The same epic informs us how Vyasa wants to make himself presentable to Ambika and Ambalika before going to their bedchambers but Satyavati insists he go even though he looks ugly, after years of austerities. As a result of this impatient act, Ambika bears a blind son and Ambalika an impotent one. Thus ancient texts give great value to a woman’s consent, satisfaction and pleasure in matters sexual. Traditionally, Agastya is the sage who took Vedic culture to the south. According to a Tamil legend, composed about a 1,000 years ago, 2,000 years after the Rig Veda, Agastya, after settling in the south, asked his student Tolkappiyan to go north and bring Lopamudra to the south. But when they came, he noticed they walked too close to each other and he accused his student of inappropriate conduct with his young wife. An angry Tolkappiyan left his teacher and went on to write an independent work on Tamil grammar known as Tolkappiyam. 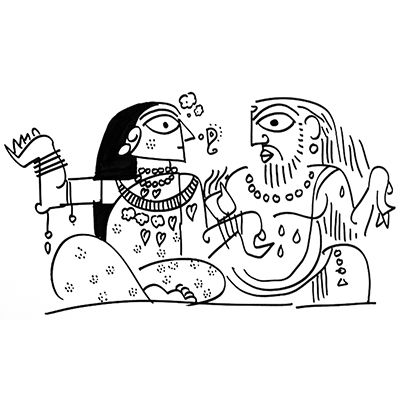 Here, Agastya, who once shunned marriage, is portrayed as a jealous, possessive and suspicious husband, reminding us of changing times, and changing emotions, and changing attitudes towards women and wives.